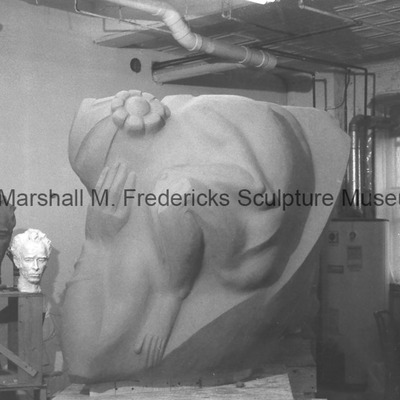 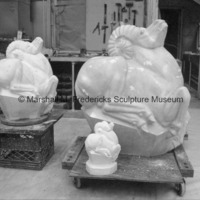 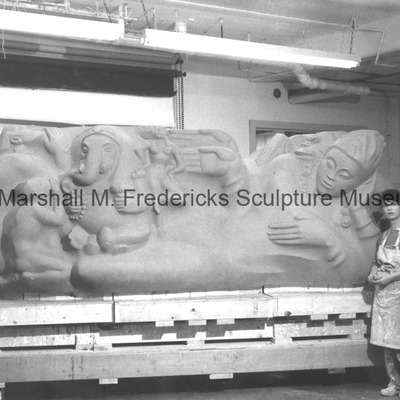 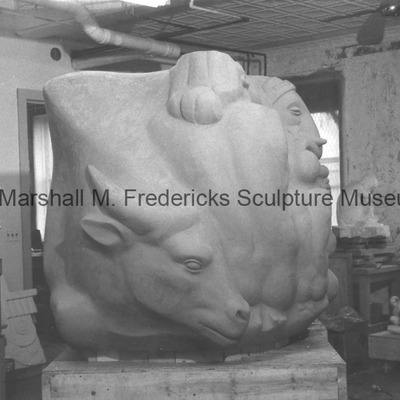 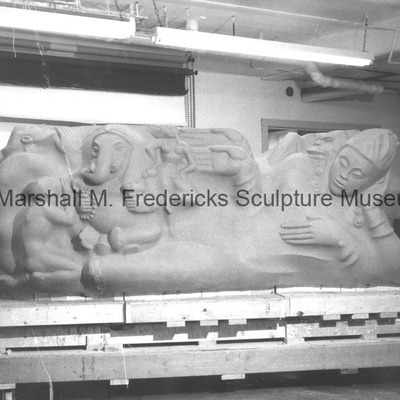 Full-scale plaster, small-scale plaster and plasteline reduction of "Siberian Ram"
An unidentified assitant standing with the plasteline model for "Eastern Civilization" for the "Cleveland War Memorial: Fountain of Eternal Life"
In this full-scale model, Fredericks portrays Eastern culture with a god identified as Buddha. 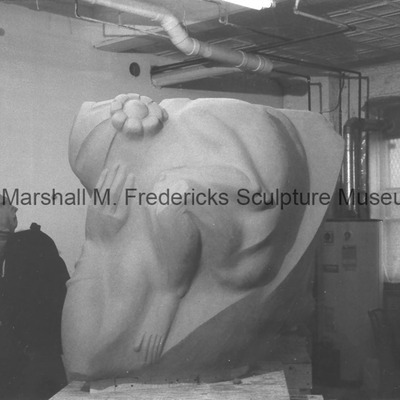 Leaning over his shoulder is the monkey god, Hanuman, who symbolizes loyalty, courage and strength. 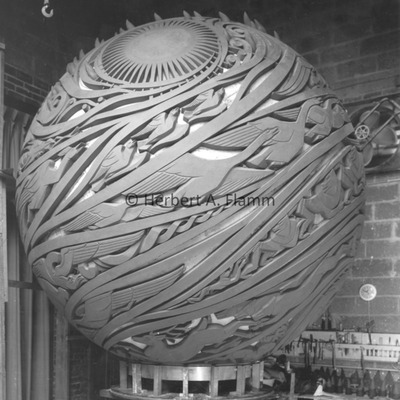 Plasteline model for "Eastern Civilization" for the "Cleveland War Memorial: Fountain of Eternal Life"
Alternate side view of the plasteline model for "Eastern Civilization" for the "Cleveland War Memorial: Fountain of Eternal Life"
Side view of plasteline model for "Eastern Civilization" for the "Cleveland War Memorial: Fountain of Eternal Life"
Full-scale plasteline model of sphere for the base of the "Cleveland War Memorial: Fountain of Eternal Life"
Plasteline model of the sphere for the base of the central figure for the “Cleveland War Memorial: Fountain of Eternal Life”. 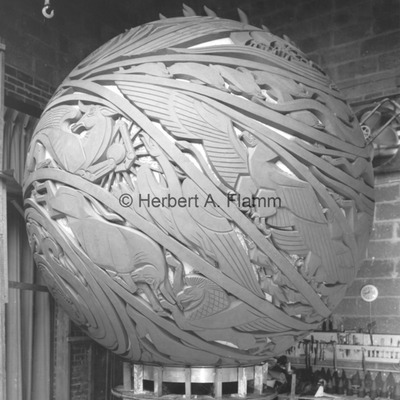 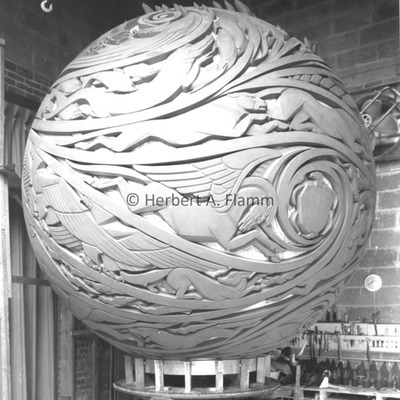 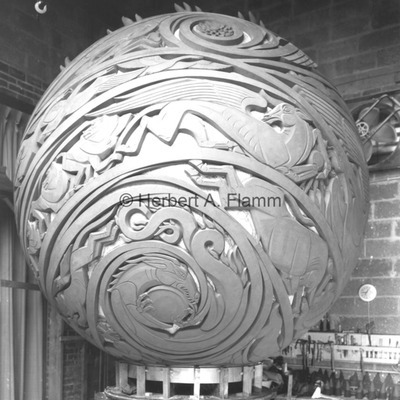 Plasteline model of sphere for base of the "Cleveland War Memorial: Fountain of Eternal Life"
Alternate view of plasteline model of sphere for base of the central figure for the "Cleveland War Memorial: Fountain of Eternal Life"